LAKEWOOD — The Hoehne Farmers men’s team was one placement away from capturing second place in the 2A team title at state this past weekend. In an otherwise close contest which saw the top four teams separated by seven points, Resurrection Christian won the honors with 63 points. They needed a top-five finisher in the boy’s long jump, one of the last events of the meet, to clinch the title over two-time defending champion Cedaredge who had 58 points. Cedaridge ended in a tie with Lyons who scored a first place in the 4X800 in the second-to-last event of the day. 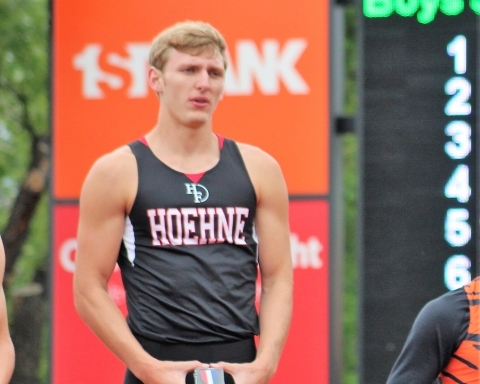 Hoehne finished in fourth with 56 points. Their last event was the 300M hurdles. There, the team scored 16 points as Jacob Yates came in first, scoring 10 and Nicholas Navarette finished fourth, scoring 6. Kyle Rowe helped the cause by placing fourth in the 100M dash in a time of 11.41 seconds. His qualifying time of 11.31 was the fourth fastest in the preliminaries. Rowe was also fourth in the 200M dash in a time of 23.38 seconds. Yates was fifth in the finals in 23.39. 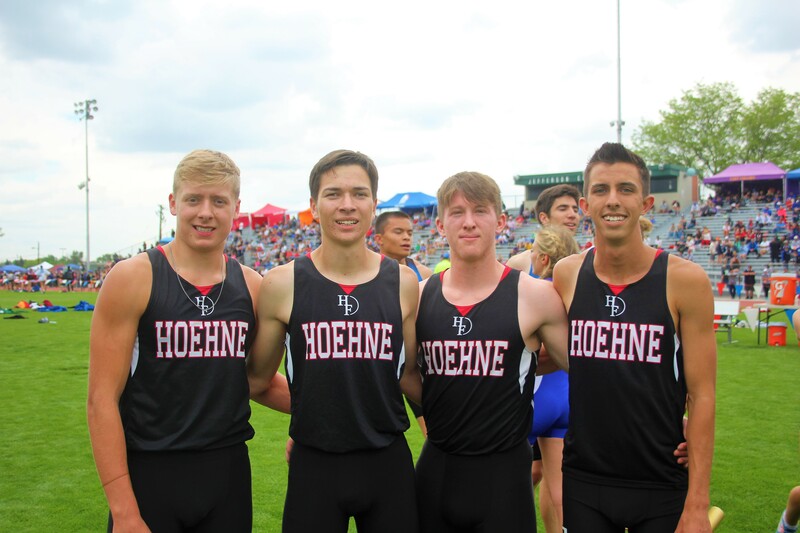 The Hoehne men’s hurdles team also performed well. Yates captured the state title in the 300M hurdles (see related story). Trystan Moltrer placed fifth in the finals with a time of 15.67 seconds, faster than his qualifying time of 15.91 seconds. His final run was his personal best time of his high school career. 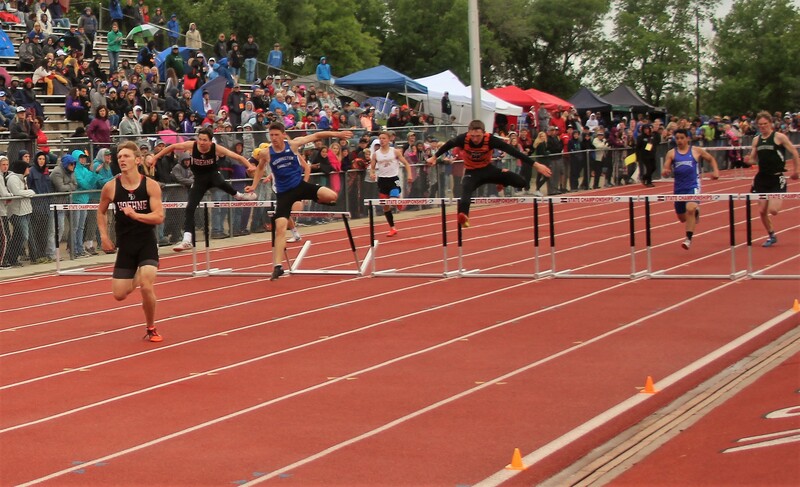 Navarette did not qualify for the finals in the 110, but he finished fourth in the 300M hurdles in 40.85 seconds. He originally qualified for state with a time of 41.59 seconds and shattered his own personal best in the preliminaries in 40.44 seconds. As a sophomore, Navarette will only get faster. Moltrer was in the finals, but fell on the second-to-last hurdle and finished last. In the discus Federico Orozco finished fifth with a throw of 134-0 feet. He made the mark on his second throw. The final members to place were the boys 4X200 relay who finished in sixth position with a time of 1:33.96 minutes. The 4X400 and 4X800M teams did not advance beyond the preliminaries.